Tesla : TheyWilllRockYou.com – For the love of music! Serving Boston and Greater New England. This guy is living proof of the benefits of social media! 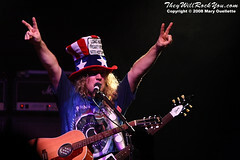 While fronting his own band, The Dave Rude Band, he was spotted via Myspace by Frank Hannon of Tesla. The rest, as they say, is history. 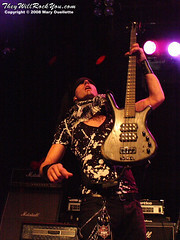 He became an official member of Tesla in 2006, replacing Tommy Skeoch. We caught up with Dave via phone from the band’s stop in Phoenix, the night before they hit House of Blues in Las Vegas. He passed along the best advice he was ever given, which really could be heeded by anyone, anywhere, anytime… Check it out! Be ready! Be ready to take advantage of it when an opportunity arises. A guy I knew back in the Bay Area told me that years ago. At the time, they had just signed this big huge deal with a big major label and you just have to be ready for it – have all your ducks in a row and have everything you need practiced, have songs, have whatever it is. So when that one lucky break happens, you can just grab it! That was really, really good advice to me. I still tell people when they ask me for advice. It’s kind of how I joined Tesla. It definitely rang really true and is a good piece of advice, and can be applied to any situation. Speaking of that, even though I know that Wikipedia isn’t always the most accurate source of info, I saw that you got the Tesla gig via MySpace, right? Yes, I did. It was 2006, and my solo piece The Dave Rude Band had put up a demo. Myspace had only been up for a few months, and Frank Hannon from Tesla just randomly found it. That was kind of my opportunity. He said, “Hey, you wanna come jam, in like two days from now?” “Yeah! I’ll be there!” “Cool!” And my life was kind of structured for my band to make it, its not like I had some 40-hour a week corporate job. I had my whole life structured so I could just kind of leave. About two weeks after I met Frank, I was on tour with his solo band. What is the one thing you can not live without on tour? You know….I’ll be virtuous and say exercise equipment. Which is true. We are out on a mini-run right now and I forgot to bring it with me so I was working out with a shower towel. I do like to work out a lot. On the last tour I went and bought a tiny set of weights and an exercise mat. Sometimes you get a cool gym or if you have enough time you can go get a day pass at some local actual gym around town but most of the time I end up working out in the dressing room or in the hallway or something. What is the best rumor you’ve heard about yourself? You know what? Recently I’d heard from a friend of mine back home in Oakland that I’d been kicked out of Tesla for my “bad attitude”. That’s hilarious, considering that I’d just come home from a tour and me and the guys are like the best of friends. That was pretty funny! I was like “What?? ?” But you’ve got to consider your sources out there! That was a pretty funny one but I normally don’t hear any rumors about myself, but that one definitely came to mind. The last one I have is – have you ever had any real-life Spinal Tap moments? I can’t really recall anything too dramatic offhand, but definitely I have been lost in arenas many times. It’s not really funny, but it’s true. That scene is so true to life, when they have the arrows going around and you still get lost. Nothing truly hilarious that I can think of offhand though. And now you can promote whatever you want! Well, my obvious plug is my band – DaveRudeBand.com. We’ve got videos and stuff up that’s pretty fun. Teslatheband.com too – you can check all that stuff out. We’ve got another acoustic tour in February and end up on the Monsters of Rock Cruise, at the end of February. That should be pretty fun! 2011 is a very special year for Tesla. This year they celebrate their 25th anniversary as a band, no small feat in today’s industry and one to be commended. In celebration, the band released Twisted Wires and The Acoustic Sessions in July. The release marks the last recordings with original member Tommy Skeoch and acoustic ‘twisted” remakes of a collection of songs from their catalog. It also features “Second Street” and “Better Off Without You”, two songs that will be new for fans but that have longstanding history with the band. The band is currently working on new music and we recently caught up with guitarist Frank Hannon to get the lowdown on the new release and what 2011 has in store for Tesla. Tesla have announced plans to release Twisted Wires and The Acoustic Sessions on July 12th. 2011 also marks the 25th anniversary of the band! To stay updated on everything Tesla visit their Official Site and Facebook page. 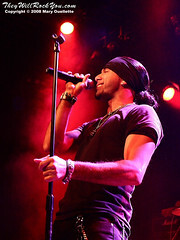 Opening the show were Michigan rockers Pop Evil who are fresh off their debut album Lipstick On The Mirror. Pop Evil (Leigh Kakaty on lead vocals, Dylan Allison on drums, Dave Grahs on guitar, Tony Greve on guitar, and Matt DiRito on bass) started the show off right with a kick to the groin and a punch to the face of unadulterated, pure, rock and roll. It’s great to see Tesla introducing some new rock to their old school fans. It’s important to cultivate the music community and keep rock alive and these guys were definitely alive – bouncing off of their stacks and rocking out with metal horns held high, I’m sure we’ll be hearing a lot more from this band in the future. By the time Tesla hit the stage the crowd was packed with hookers, pirates and thieves…literally. (I told you it was Halloween!) As the stage started to fill with smoke the band (Jeff Keith on vocals, Frankie Hannon on guitar, Brian Wheat on bass, Troy Luccketta on drums and Dave Rude on guitar) stormed the stage and went right into Forever More – the title track off of their latest studio album. 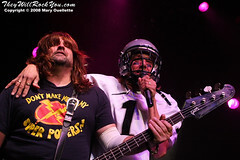 Jeff Keith attacked the stage dressed from head to toe as one of his beloved Oakland Raiders (A brave move in New England Patriots territory – but I admired his passion nonetheless!) and sang a song or two from beneath his football helmet. The band seemed like they were in rare form from the beginning notes of Forever More until two hours later when they finished off the night with a full on jam version of Free Bird. I can’t remember the last time I saw a band play with that kind of energy for two hours straight. It was by definition the ultimate rock show. Not only did they rock out for two hours, they had a blast doing it. 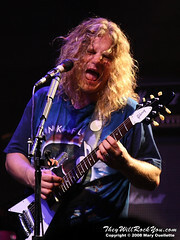 Jeff Keith wore a smile from ear to ear from beginning to end and Rude, Wheat and Hannon often took center stage for double and triple axe and bass attacks. Although sometimes it was hard to see Troy behind the flying drumsticks, we definitely heard him loud and clear. When a band has had the kind of success and longevity that Tesla has had, often times fans want to bybass the new songs in favor of hearing the old. Such is not the case with Tesla who keeps churning out release after release of timeless, solid, bluesy based rock songs that would satiate even the hungriest of rock appetites. With that in mind, they played through several of the songs off of their new album without losing a soul. The crowd couldn’t have been more into it from moms with their sons to first timers to those that never miss a show, the diversity of the crowd was awe-inspiring proving that music truly does transcend all outward appearances. The crowd was in full sing-a-long mode throughout much of the set that covered everything from 1986’s Mechanical Resonance to the present day Forever More, from Modern Day Cowboy to Fallin’ Apart. When Dave and Frankie busted out their acoustics we all knew it was Love Song time, ..proving that really…love is all around you…in the form of 1000 sweaty Tesla fans. I hate to keep saying that Tesla has been around for awhile but the truth is, they have. Please don’t mistake my admiration for an insult though, it’s just that in today’s music industry bands are churned out with cookie cutter ease and only the strong survive. Tesla proved from the start that with strong songwriting, unmeasurable musicianship and bandmembers who genuinely love what they’re doing, the strong can not only survive but thrive.